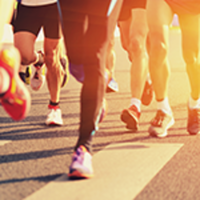 Teams of 13 (or as few as 6) people will race for their fastest collective marathon time. May 18 9am start (gates open at 8am for setup) at the Woodlands, located on Woodland Avenue. Enter through the big gate across from the trolley portal. Follow the signs when you come in. The race itself will take place at the Woodland Stables and runners will do the trail loop. Each team will select a runner - different than their last mile runner - to run the final 0.2 miles to complete the official marathon for the team. Selection for this position is considered a great honor. Each team must devise their own baton. It an be anything - a snap bracelet, a banana, a stick, a pompom, etc. Each team's champion will complete his 0.2 mile leg with a torch of their making. It probably should not be on fire, but I'll look the other way.